After a long discussion about aerodynamic drag and Cd values of various Citroën models on the 2CV-L mailinglist I decided to put some pictures of the aerodyanic test objects Fritz and I built during the last years on the OECC WWW site. 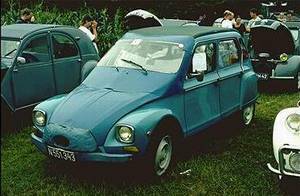 The idea to improve the aerodynamic of a Dyane was born after I met Friend Wood and his Tryane II at the 2CV world meeting in Orleans 1989. He gave me the book "Flying on 4 wheels" as a present. After reading this book I started modifying my Dyane by putting a rounded front with a "Costin nose" on it. It was Fritz, who asked me to start at the 2CV race in Zeltweg after he had payed the entry fee. Our aim was to improve the performance only by reducing the aerodynamic drag. So we didn't any changes on the engine. We only put 165 x 15 tires on the front wheels for longer total ratio of the gearbox. We limited the time for the modifications to 1 and a half day. So we began to design and build a fairing on Friday afternoon and went to the racecourse at Sunday morning, where we put the fairing on. We would have won the price for the most silent car (if there had been such a price). The noise of engine was reduced to the fairing and the noise due to wind was very low. After the long straight at the start it goes up a hill. At the bottom of the hill all 2CVs and Dyanes where close together at a speed of about 120 km.p.h. Climbing the hill in 4th gear speed of all cars dropped simultaneously. At about 100 km.p.h the areodyanic test object did not slow down anymore, while all the others still lost speed. After a corner, while accelerating from 70 in 3rd gear I had a 2CV besides the aerodyanic test object acceleration was similar till we reached 120 km.p.h. At this time the 2CV had reached its top speed, while the aerodyanic test object still increased in speed till the next corner. Neither Fritz nor I are good race drivers. So we lost too much time in the corners. But at last our aerodyanic test object was faster than all unchanged 2CVs and Dyanes. 2 years later Fritz built the next test object. 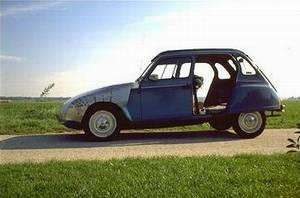 He put a wind screen from an Ami 8 in front of the original Dyane windscreen. Tests with this car did not produce reliable results. Improvement in top speed or fuel consumption was not to distinguish from measurement failures (5 to 10%). Driving in his AeroDyane is very comfortable. Most of the noises you have at a speed of 110 kph are gone. 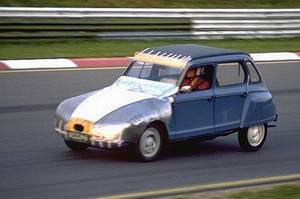 The next step would be to put a new body with ultimate low drag on the chassis of a 2CV. As I remember, the Swiss designer Luigi Colani did such a project in the 70'.